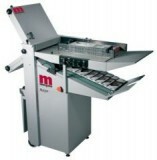 Crease & Fold up to 6,000 Sheets per Hour! This speed is maintained irrespective of the number creases being applied to the sheet. 9 sheets each with 9 creases can now be produced in less than 9 seconds! We challenge anyone else to do it more quickly with the accuracy and repeatable quality of the DigiFold Pro. The maximum sheet size is 27.5" x 15" (34.5"mm x 15" with optional extension table) allowing a wider range of jobs to be tackled. Perforation is also standard on the DigiFold Pro with up to 5 perforation wheels being used across the sheet. Traditional rotary scoring machines use circular blades that are in constant motion as the stock passes through them. This creates a plowing action that actually cuts through the top fibers of the paper or card in order to create a score. Inevitably this weakens the paper and encourages cracking. 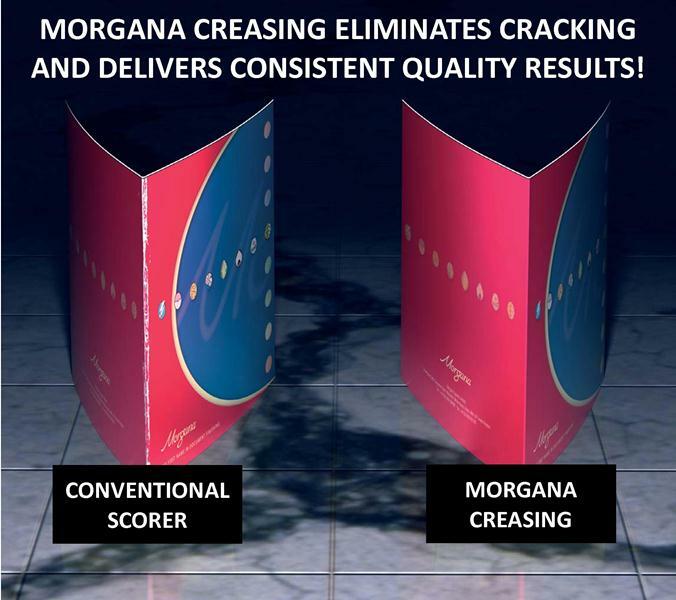 In contrast, the Morgana DigiFold Pro employs a unique creasing rule and matrix, the DynaCrease, that eliminates tearing and therefore, cracking. By using this patented technology, the DynaCrease, we have managed to increase the speed to over 6,000 8.5" x 11" sheets an hour. Speed increases when running smaller stocks and is achieved by creasing the sheet without stopping it, yet maintaining an accuracy of +/- 0.003". Controlled by the same innovative 7" SmartScreen panel as the rest of the Pro range, the DigiFold Pro is instructed how long the sheet is and which crease/fold to produce. All settings and adjustments are made using the New SmartScreen and as only symbols are used, operation couldn’t be simpler. The DigiFold Pro uses our patented flying knife technology which was developed to prevent the scuffing and marking on digital stocks that are caused by folding using conventional methods. This dispenses entirely with buckle plates and conventional knives, using instead an electronically controlled contoured flying knife around extra large diameter rollers and moving at the same speed as the material passing through the machine. Rather than the solid deflector used in most folders, the DigiFold Pro uses another patented device in the form of a dynamic sheet deflector that only comes in contact with the leading edge of the sheet. 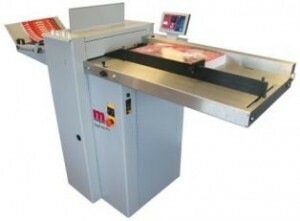 This allows single or multiple folds to be performed without risk of scratching or marking. The beauty of the DigiFold Pro is its simplicity allowing the user to invest in a machine and to improve their productivity and quality immediately. This Savings Calculator is already populated with sample figures; click on the cell(s) where you want to plug-in your own figure(s) and enter your figure. Then click on any cell and see the calculation.